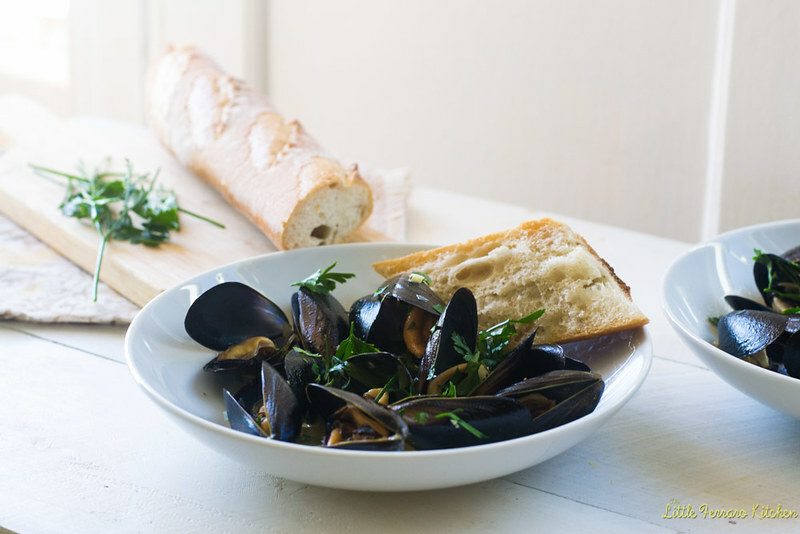 Julia Child’s classic recipe for mussels mariniere couldn’t be any easier. Steamed in minutes with shallots, garlic, white wine and fresh herbs. Happy 102 birthday Julia Child! Ever since I opened the first pages of Mastering the Art of French Cooking, I don’t think I have been the same. I conquered the fragile “Cheese Souffle” and have been hooked ever since. 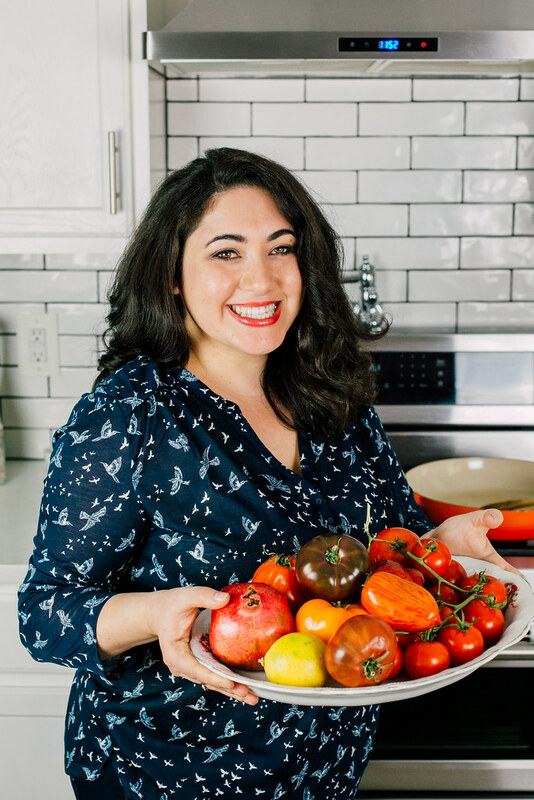 There is an entire page dedicated to stiffening egg whites, that is how I learned how incredible passionate Julia was with cooking. From now on, I look for the “streaks and traces”. I know the steps it goes from gloppy to vibrant. Yes, you can call me the souffle Queen, thank you very much. (Total narcissism here). However, for her birthday, I wanted to make something simple and pronounced. 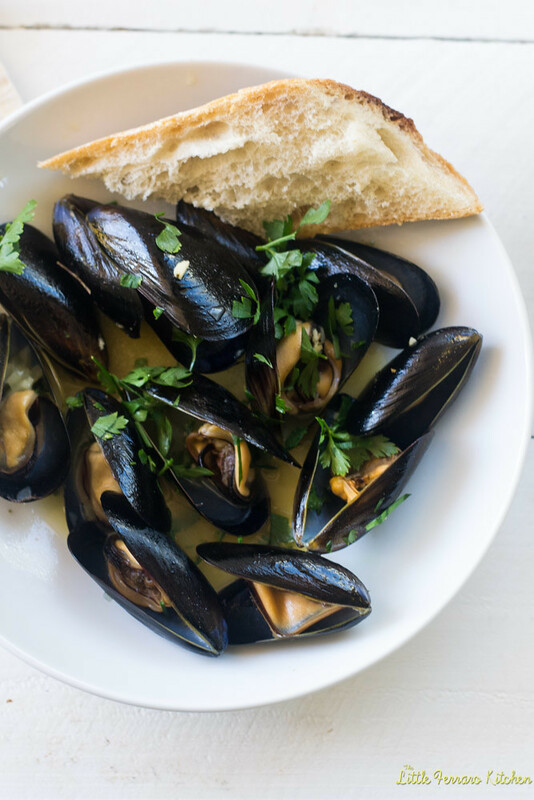 I love, love mussels and remember eating bowls full of mussels marinara when I was younger. They have a special seafood flavor that nothing else has and it takes me right back to my childhood. We found gorgeous fresh mussels that were begging to be eaten. 2 lbs of mussels for 2 people was nothin’ and I am craving more as I am writing this. The beautiful thing about this dish is it’s pure simplicity Outside of cleaning and scrubbing the mussels, the entire dish is made within 10 minutes. The simple sauce of butter, wine and herbs is exquisite and begs to be slopped up with a roughly torn baguette. That is if you don’t shove the bowl in your face and drink all the juice first. If you haven’t worked with mussels before, it’s pretty easy. Each mussel comes with a little “beard”. Pull that out (it may be a bit hard at first) and then scrub the outside of the mussel. As you’re working with them, keep them in ice cold water until you’re ready to cook. Another tip I heard about, was to add a tablespoon of flour to the water. Supposedly this helps the mussels spit out any sand that may be lodged inside them. Scrub each mussel and rinse well. 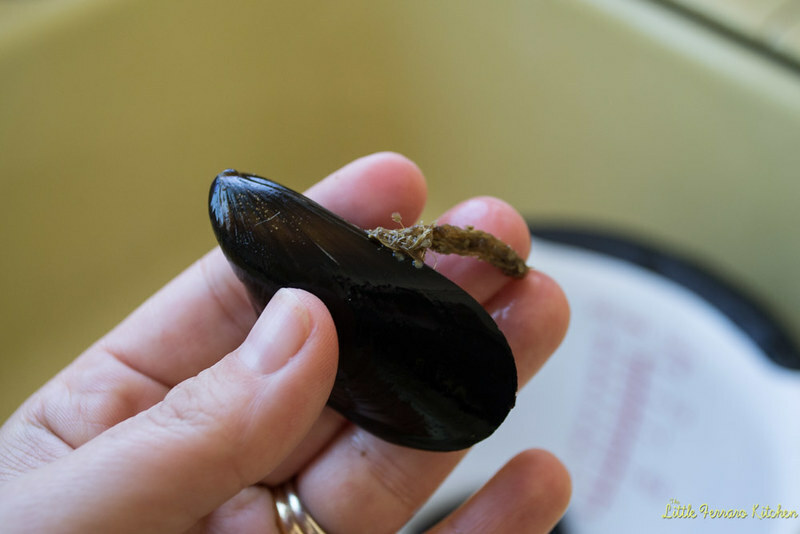 Pull the beard off the mussel and place all cleaned mussels in a bowl filled with cold water. When all mussels are cleaned, sprinkle flour and toss gently. In a pot, bring the butter, shallots, wine, herbs and salt and pepper to a boil. Allow to reduce slightly (about 4-5 minutes). Use your hands to remove the mussels from the floury water and rinse them well in a colander. Don't pour the mussels into the colander because the collected sand could pour right back on them. Add the mussels and close lid on the pot. Allow to cook for about 5 minutes or until the mussels all open up. If there are any closed mussels, discard those. 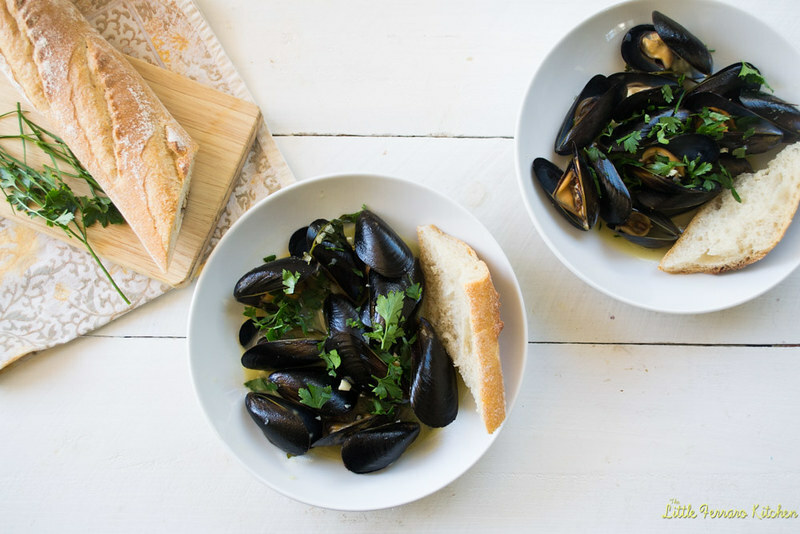 Serve the mussels in wide bowls. Use a ladle to spoon mussels in bowls first, then use the ladle to pour wine sauce over the mussels. Garnish with chopped parsley and crusty French bread. So delectable! That seems impressive. Claudia recently posted..Jak wybrać na wyjście buty ze skóry? 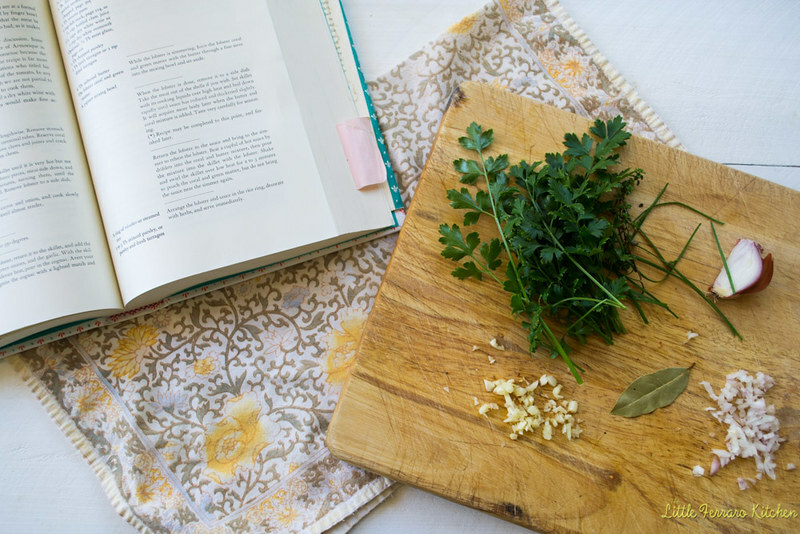 Reminds me when we did our 15 weeks of Julia Child, how I loved doing her recipes. This looks amazing!! That is a wonderful idea! Thank you! One of the easiest, most delectable, more-ish and wonderfully social dishes in the world. Groups of us, our friends and family used to share giant pots of freshly harvested sweet moules marinière right on the seaside in Belgium with lashings of warm freshly baked “stockbrood” (baguette) and more wine to drink. Here they will insist that this is not a French dish at all but all Belgian. Of course Belgium being small and never far from the coast you can also get fresh moules marinière in most of the finest Bistros across Belgium and there are many, very many, from Brussels to the deeply wooded Champagne-Ardenne and beyond. Suffice to say moules marinière it’s a firm national favourite of the Belgians, even saying so is nothing short of a gross understatement. I can’t be as dogmatic as the Belgians are about this dish’s provenance but from only the tinniest bit of research needed the difference might all boil down to just one ingredient, cream, and the distance from Zeebrugge to Normandy. Putting aside the fact that French speaking Belgians only just out number the Flemish speaking Belgians in Belgium, the national language still favours the Flemish, it’s Dutch. Collectively however and this includes the tiny German speaking regions of far Ostbelgien they don’t use cream in their moules and the French in France do. Just 2-tbsp of cream mind. Top French chefs from Raymond Blanc to Hélène Darroze will insist. The taste of the sea however is nowhere as magically, simply and beautifully made cuisine by a mussels own delectable liqueur, reduced briefly with a little dry white wine, herbs, unsalted butter and diced onion as in moules marinière. So personally I go with Julia and the Belgians on this matter. Unsalted butter is just enough dairy to make it rich hearty and divine. Now of course the question of the other most essential ingredient of moules marinière besides the mussels themselves, the baguette must be mentioned here. Yes Im afraid the French can’t lay claim to that either, but suffice to say here nor can the Belgians. So one all is a good place to leave it. Either way you make them, enjoy. A more satisfying, simple and delicious feast as this is very hard to beat. Anton, thank you so much for sharing so much history into the dish! I did not know it was connected to Belgium at all! I agree, the butter is just enough creaminess and I love the light broth the mussels offer.